This month is all about Organizing Basements and Attics. These areas of our homes are often the dumping grounds for anything we don't want to deal with or have space for in the main areas of our home. And they can become overwhelming if they're not organized well. So check out all the tips in this post and find the ones that will help you take back control of your basement or attic! And after reading those tips, if you're looking for basement or attic organizing inspiration, you can also check out my Garage / Attic / Basement Organizing board on Pinterest! Do you have an attic or a basement? How do you organize it? 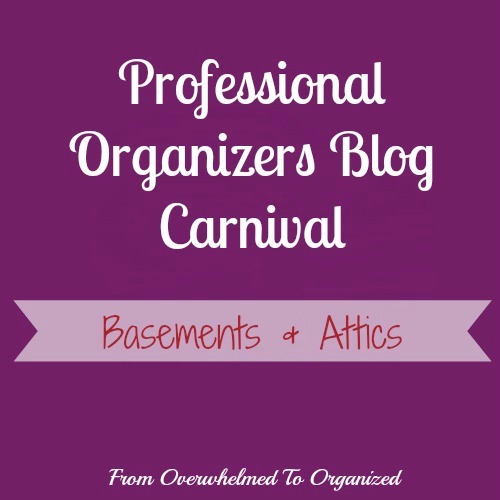 Which of the posts in the Professional Organizers Blog Carnival will help you organize your basement or attic the most?